Arriving in Australia from London in 1966 with his parents, at the age of eight, Peter remembers that the family lived in an area “where quite a few artists lived”. Water-colourist Dudley Wood who held exhibitions at his home encouraged Peter’s early endeavours. Peter also received encouragement from his neighbour, Sir William Dargie who explained tonal expressionism to him. Later Peter studied under two of Max Meldrum’s pupils, Ron Crawford and Alan Martin. Peter attended the Melbourne State College and completed a Bachelor of Education, which included a study tour of the European art galleries which opened his eyes to the broader vision of painting. Peter taught painting and drawing at Melbourne State College for three years and then devoted some years to full time painting. Peter held his first exhibition at Charles Bush’s Leveson Gallery in 1982. Each year Peter has continued to have one main exhibition. In 1988 Peter was invited to join the Twenty Melbourne Painters group. Peter has returned to teaching at various venues, the Victorian Artists’ Society, the Council of Adult Education, at his home and at the gallery the Doncaster-Templestowe Artists’ Society. For the demonstration this evening Peter chose a scene from the Victorian coastline showing some of the dramatic cliffs along the west coast as it meets the Southern Ocean. Peter has very good formal training so as he painted he explained the need to build up a painting from thin to thick paint, and how important composition and the use of warms and cools are in balancing out a painting and directing the eye around. Harmony in colour is very important, the use of light and shade, balancing out your percentages of cools and lights in a scene, the use of complementary colours for drama whilst also watching your tonal values and perspective are all important. Peter had two photos as references. He liked aspects in each so painted his version of the actual place. The painting is after all your artwork, or you may as well jut use a photo. Peter had also painted on site so had first hand knowledge of what the camera could not show up especially using a colour laser print from it. Having painted a few times on site recently, I have found it far more enjoyable that I remembered, still a little challenging but really worth it – especially if you can go out in a small group of artist friends to talk about your processes as you go. The painting for tonight was on canvas that was adhered to board and gessoed in an off white colour to take away that starkness that many of us hate when first looking at a canvas. It also added a little warmth that would work nicely under the layers of paint going over the top. Peter painted from the top broadly painting in the sky and the darker areas of the cliffs and sea. He worked out his light source and where his shadows would fall. He mentioned the importance of working out your tonal range early so there are no surprises later in the work, so a dab of your darkest dark and lightest light somewhere on the painting is a good guide. With most areas marked in, Peter went to working on the background. Painting from back to front allows for going over edges which later will “settle” items in to the landscapes rather than looking like they have just been plonked on top. The use of lost and found edges, some hard edges where the highest tonal contrast occurs used to guide the eye around the painting and prevent something from pulling you up in one area. Cooler colours were used in the background with lighter tones and as he moved forward the tones became stronger and warmer high key colours were added as texture and interesting features. As the focal point of this painting was in the mid area to the left (about one third in and from the base) this had the sharpest edges whilst the foreground was made softer and with less detail, even though holding the warms and darker tones. The addition of a couple of human figures gave the scene scale and the high key red on one added that really high key splash that attracts your initial attention to a painting. Peter’s use of simple and precise strokes of the brush keeps his colours clean and crisp. He doesn’t overwork his paintings and what may to some look broad and incomplete looks something amazing when popped into a frame. This finishing touch really showed how his method of not requiring every little detail in a painting to work so well. Peter was very generous with his time during the demonstration, we chatted and he explained his processes and techniques. I want to thank him for being the very kind and informative artists that he is. I will be seeing him demonstrate at McClelland Guild in a month or so and am looking forward to another opportunity to see this fine artist at work. Final Note: Due to a mix up on the night I was given an award for one of my artworks in the wrong category which I could not accept, so it was handed on to another member. Peter gave me some very kind comments about my seascape pastel which in lieu of an award was great to receive. My thanks to members who approached me afterwards to congratulate me on my honesty and integrity. Our session today was based around complementary colours. For this exercise I chose a pic of purple irises. The idea was good I thought but the amount of green in the photo soon became a problem that I could not overcome in a short morning session. The idea behind the use of limited colours is to make one of them dominant taking up to 80% and the other prominent. This means that one colour takes up a lot of the painting area and the other is used as the “highlight” or focal point so that it really stands out. In the case of the purples and yellows additional use of support colours used to prop up or highlight the dominant colour is used, these were Tasman Blue (which I thought I owned but could not find in my kit) and burnt sienna. These are added to the purple to darken it, lighten it or warm or cool it. You can use white in all the complementaries that your select for a painting as well so there is a large range of tonal values you can create. The mixing technique had me confused here. It seems that the best recipe is that you can mix purple with these supporting colours (Tasman blue and burnt sienna) but not the yellow, it can only be mixed with a mix of the purple and one of its supporting colours (for example purple and Tasman blue). The goal is to create a unified look via the use of colour. this is because the purple was my dominant colour. Another example is Viridian and Cadmium Red. You decide on the dominant colour and you can add the supporting colours to this. In this case colours such as burnt sienna and yellow light. The burnt sienna used to darken and warm and the other to lighten. We were asked to take the time out of the workshop to practice mixing greens. This is the second time this has been talked about in a week for me. I am now feeling that this often overlooked colour, like greys and whites, is important to understand – especially in Australia where our greens in the natural bushland are so different to Europe and the USA. During the following demonstration, David showed us how he works his colours from top to bottom and left to right of a painting. The tonal values and warmth are increased or decreased as he works his way from left to right and top to bottom. For our second afternoon painting I did a little better job. I asked David if he has off days and was so relieved to hear that he does as well. I just don’t like having them in public. Anyway, I chose a subject I know very well so I could concentrate on the mixing of the colours. I wasn’t up to handling a new subject and the task of manipulating my paint. For this session we used Green/Red complementaries. Cadmium red as the dominant and viridian as the prominent. The supporting colours were cadmium yellow light and burnt sienna. These were only to be mixed with the red this time. This was quite helpful as I was doing a race horse with jockey. The challenge is usually the jockey as I am still struggling with people. This time the balance came out a bit better and David gave me some tips on creating movement with a simple dash of the brush – that next step I am looking for in my work. It takes it from a copy from life to a unique personalised painting or artwork. Complementary colors are any two colors which are directly opposite each other, such as red and green and red-purple and yellow-green. In the morning we were asked to compose a painting using the yellow/purple combinations. 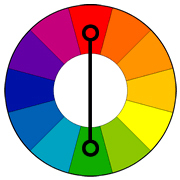 Try painting a scene with complementary colours from the colour wheel using the above diagram as your example, plus white. The colour straight out of the tube will be your darkest tone for that colour but you can use the two supporting colours that I mentioned earlier, and you can lighten it using the white to get as many values as you like. It doesn’t have to be photo realistic, in fact use the photo as a guide only, not as the rule to stick to. It may be a good idea to discard the photo after you have the basic idea and paint creatively and not as a slave to your reference. Below is one of the works I did at the workshop. It could always be improved but I was not aiming at completing a finished artwork, but at practice pieces. They reflect process and not completion and as such I am happy. David looked at all our works at the end of the day and showed us where our paintings could be improved. Apart from a couple of little marks and showing me how to create more movement, he left my second work alone. David said he liked my second painting more than the first. I did as well, considering that I was having one of those days where I couldn’t get brain and hand to cooperate. I plan to spend some time in the future practising my complementary colours, as I feel I can get some amazing results from this limited palette. I just need to find some interesting subjects that catch my eye and get to it. The last excursion for the semester was to our local gallery the Mornington Peninsula Regional Gallery. I am a member, not that makes much difference when going with the school, but it does give me a sense of belonging. MPRG is a nice gallery, it isn’t too large – so you can’t get lost in it, it is easy to get to and they hold exhibitions that you would think would only be held in very big city galleries. Going there is also a chance for me to catch up with the Oakhill Gallery which is on the main road in front and to the left of the MPRG rose garden as you face it. I am a member there as well and am starting to exhibit my own work there when the opportunity arises. My hope is that people will do as I often do, and take the time to visit both whilst in the area. The big difference between the two is that most of the work at Oakhill is for sale so you can take something home with you if you like it! I go into the Archibald with mixed feelings but hopefully a fairly open mind. Given that I do have my own taste in paintings and it really does come out at something like this. After an initial first work done in a traditional manner, the paintings ran off in a modernist trend with graffiti style paintwork mixed with modernism and splashes of identifiable figurative work. Some of the colours used were more like you would see in a railway tunnel rather than a gallery, so really didn’t appeal to me at all. I couldn’t identify some as portraits and to say the work had stretched the theme of the genre of portrait to breaking point is I think, putting it mildly. I know the Archibald is known for the controversy around it, and some would say that is part of the event. For me however, a portrait prize is about just that, portraits. The inclusion of a huge amount of clutter around an insignificant indication of what is supposed to be the subject, seems to be a way of totally avoiding having to paint an actual portrait. Characatures (cartooning) for me are not portraits. Line drawings that are so vague that you can’t tell who or what you are looking at are not either. I may annoy some or you may agree with me, it really doesn’t matter, as this is just my opinion, and others are welcome to theirs. What did I like in the gallery? As usual I like the winner of the Packer’s Prize. A sensual and beautiful painting of Tara Moss. I also liked the painting of Dr Catherine Hamlin, it had so much character in the face and the rendering of her blouse, the detail in her skirt and the rug she had on the chair were stunning – and still painterly. The Portrait of Ella was a lovely painting of a young girl without being typical of a child as she is shown deep in thought and there was as story in the painting. There’s a line between realism and painterly impressionism that I like and am comfortable with. Too far one way or the other and it might get my attention for the skill level but not to engage with on any emotional level or in any kinship as an artist. That said, several works were of a style that invited me to have a second look and linger to soak in the beautiful way they were done and engage with the subject. Others went from not interesting to a few WTFs. I want to emphasise at this point that this is purely a personal opinion, valid or not. By the way I purchased the book about the history of the Archibald Prize at MPRG whilst there, so further education for myself about this event is forthcoming! A few fellow students and artists that I know from the Peninsula area had work in this exhibition so I was keen to have a look. There were some stunning pieces in this exhibition that could so easily have hung in the MPRG and not been out of place. My fellow students did a great job and the works was great. Tash had her self portrait there which was getting some positive remarks, as well as the portrait of Jon Hatfield by Livia Caulfield. The eyes in this one nearly followed you around the room and she totally captured Jon in her work. Geoffrey had a lovely painting which was a stand out in the room he was hung in. My friend Margo Vigorito had a beautiful acrylic painting which looked more like oils in lovely muted colours, a bit different from her lively and vibrant use of colour but just as stunning. My favourite from this exhibition was the Bush Poet by Vicki Sullivan. A very traditional portrait and beautifully done. I was surprised that I didn’t see an award next to this work, I thought it was a stand out brilliant painting. I was so happy to see a lot of students coming over from the MPRG to Oakhill. The small gallery is mostly run by volunteers and has a shoestring budget so support from the community is really important. Congratulations to all the students from TAFE who entered the Little Archies, you all did a great job and should be very proud of yourselves. Today we were due to have more artist’s statements from fellow classmates. The ones booked for the day were not in class and they have now missed the opportunity to present for the semester. I don’t know what this means for their assessment, and frankly it isn’t my business as a fellow student to worry about. As a potential trainer I may have views but not for this blog. Absence meant that the other subjects for the session were given more time, which was good for me as they were very interesting. We talked about Benchmarking. This means comparing against the best, or setting standards. Something that my partner and I talk about a lot in reference to what I am producing in my arts practice and where it is going. What are your expectations in the future for your practice? David has started the process of asking each of us where we are intending to take our art, what sort of job or business we are looking at entering or starting and how we intend to get there. IE: A business plan. These are some of the results form questions asked of students so far. Picture a good or ‘alright’ job. What does it entail? So, how do you get there? what is the next step? Write a letter (not email) to introduce yourself and what you want to talk about. State when and how you will follow up for a meeting with a phone call. (EG I will call you on Monday 30th July at 4pm if that is convenient for you. If you would like me to call at another time suitable for you could you please contact me on this number and I will be happy to work in with your schedule) I am interested in a career in teaching art and would like the opportunity for a brief chat. NOTE: For sponsors, people like a definite idea of how and where their money is going to be spent. Having a clear plan, professional manner and objectives shows management of your business and the potential of good use of their investment in you. This starts with the first contact. Contacting a school early or mid semester show initiative and enthusiasm rather than sloppy planning. Send out to various venues. Keep track of where you send what and follow up on all of them. Further education is required in most of these roles after the Diploma of Visual Art, with a degree course at a minimum. Conserving required chemistry, physics and other education as well as art history, very good eyesight, a steady hand and extreme eye for detail. Holding your own one person shows requires the ability to business plan, promote and produce art unless you are willing to get people in to help you with these things. Not all artists can juggle the time to get all of the paperwork let alone the promoting and venue organisation. So why go solo? It was suggested that for this it would be a good idea to get a list of good venues to display at, as well as the interest groups (EG: Model train clubs, steam train enthusiast clubs for train paintings) so that you have an already interested group attending the exhibition. This is why horse portrait artists advertise in racing, stud and general horse magazines, and dog painters in dog show and breeder publications. These chats will be continued next semester, so the rest of us now have a chance to have a good think over the next few weeks about what we want to do, how we want to do it and how we are going to respond when we are asked. I look forward to trying to articulate the two pronged plan I have in my head for my business and how I hope to get there. ” I like to make paintings that show the puzzle of existence. John studied during 1966-68 for his Secondary Teacher’s Cert., Melbourne Teachers’ College, then went on to do a Diploma in Fine Art (Painting), RMIT and in 1970-73 was a Secondary Art Teacher. During 1974-75 he travelled Europe and Asia with the assistance of the Australia Council, Visual Arts Board. Since then he has taught at TAFE and had various jobs as well as painting and sculpting. His works have been shown in several high profile galleries and exhibitions. John is ten years older than me and it was interesting his view of life growing up and how he has put many of his memories into his paintings. He describes his painting as mostly self taught as he talked about his painting teachers in RMIT at the time as being people who passed by occasionally but had little input as far as technique, methods, use of materials or much else. A situation which I hope has not continued as I expect more from learning institutions. I had a good look at John’s work on the web before the chat and even though not entirely to my taste I found a lot in his paintings to be admired. The floating dogs, people and objects are not my thing, but the vivid use of colour, the application of the oil paint and the rendering of many of the subjects is beautiful and interesting. John describes his work as record of or attempts to squeeze time into a 2D space. Things from separate times are put into the one scenario and icons from his past our placed into a type of stage setting to create a dialogue or a story for the viewer to either interpret or make up for themselves. Since his work is mostly figurative and has a realist touch, and he admires such established artists and not the “bleeding edge” of the time, it is no surprise that during a time of abstracts being the thing to do in art school, he was a bit different in his choice of style. More the loss really for those he studied with, as his narrative paintings really do invite the viewer in to look around and see what is going on, unlike modernist art which I also find very dry and unappealing. I very much liked John’s paintings of the roads travelled in the Red Hill and Cape Schanck areas. The play of light and shadow showing the undulating road surface with the curving roadsides and trees arching over to create a type of tunnel effect pulling the viewer into the painting was very interesting. Both these spots appeal to me as well and I have planned to do some work centred on the tree-lined roads running through the Red Hill area in particular. His description of being in the studio and losing track of time, food, drink and the whole world outside is so familiar to me. I call my space “The Zone”, where time, space and the rest of the world disappear! The honest description of the financial realities of being a professional artist were refreshing to hear if not a little sad, as most if not all of us will need to supplement our income in the future. It made me more keen to open my own gallery which my partner and I have discussed in the past, as we see commissions and costs for emerging artists as being no more than rip offs in a lot of cases. John is happy to see his work leave his studio, he doesn’t hold on to many out of any emotional need. If you want to sell, you need to let them go, even if you do paint subjects for your own enjoyment of the subject and stories. I personally am thrilled to see a work go to a new home! (especially in exchange for money to keep my business going and buy more paint!) One work leads to another and what is not totally resolved in one can carry on to the next as the experience and learning of a lifetime continues. John works on one piece at a time so he can work through the story he wants it to tell, as they all evolve as he works on them. He works on linen for its ability to last (and it is what galleries traditionally have required), primes with oil based primer and rabbit skin glue and applies the paint in thin glazes to thick luscious coats. He doesn’t frame but leaves it to the buyer to add their own last touch to their purchase. Framing can be a personal thing for customers, so I understand what he means, having reframed for a couple of people. Paintings are illusions, John said, which I guess means that we are the magicians or illusionists, creating something from nothing – or stories and dialogues from memories, myth, stories and poems. I can deal with that. This was a very good chat today. It again proved that you don’t have to want to paint exactly like someone to get a load of great information and enjoyment from listening to their story or from looking at their artworks. As long as it is not hugely offensive or upsetting, I will try to glean what I can from those who are willing to take the time to pass on their experiences and understanding. So thanks John! Sometimes it is good to just have a sit and think about how things are going. Sometimes your are prompted into it by others such as teachers or spouses. Sometimes it all seems to happen at the same time, which leads me to think that karma or something similar is at play. Whatever it is I have had all the above happen recently whilst painting and assessing my artworks, and where they were heading. For me it is easy to keep producing an “eclectic mess” as I call it, motivated by lots of things I see that look attractive, or move me to paint them. Not often is it by memories of my life or the need to reveal anything too personal to viewers. Thanks to very “digging” chats with teachers I have been motivated to try to put a little more of myself into painting to see where they lead, and to push the story telling capacity of may paintings. This has led to new bodies of work that I had no idea I could produce. Thank you to those who have had faith in me to be able to do this. It has incorporated into one of the best years in my life. The paintings are flowing out in abundance and thanks to my extra studies with an artist that I admire, the technique and the understanding of my medium is fast improving. It is such a buzz to stand in front of a painting and think “I get it”, I understand what colours he/she has used, what method they are using and why it is working! Even better to be able to start to apply these to my own work. Apart from all these, my confidence is improving and I feel that I have a future not only producing art but also passing on my understanding to others via lessons, workshops and demonstrations. Deciding to participate in the Visual Arts course was one of the top 5 decisions of my life. It has been life changing, life confirming and has given me back the soul and spirit of an artist that I truly believe I was born with – and the permission to myself to be that person. In two weeks we present our work for the first semester. I have a huge collection of work and I am very pleased with what I have done. Not content to stay as it is, but rather excited as to where it may lead. To anyone reading this that I study with or learn from, all I can say is that you have all made it an interesting and exciting journey and I thank you for being here, it wouldn’t be the same without you! To finish off I thought I might add some projects I have been working on so far during my holidays. 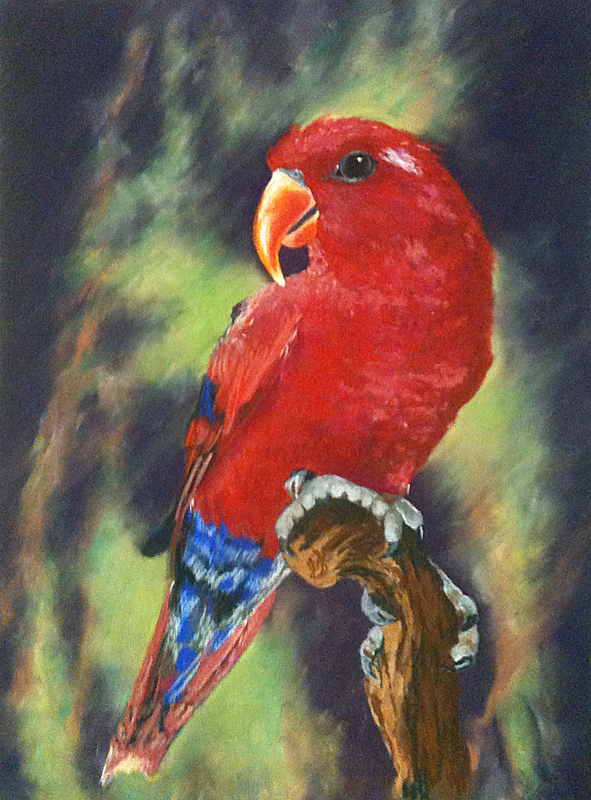 The parrot is about half done, so is a progress shot, the pastel of geraniums is a study for the oil painting. The paint is literally piled on to this work which is a big change in direction for me – and fun I might add! 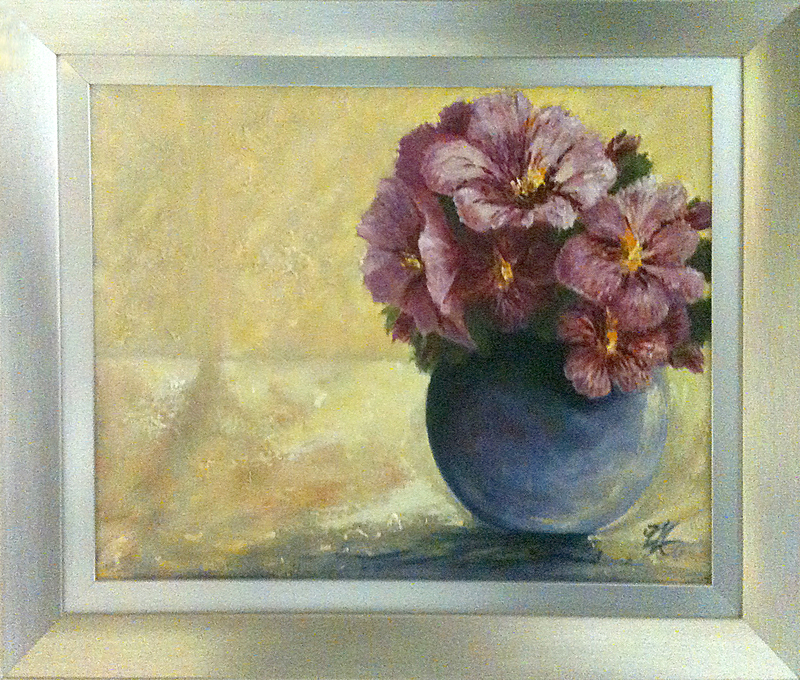 I also wanted to see if I could balance out the composition with just paint texture and light with the vase and flowers. 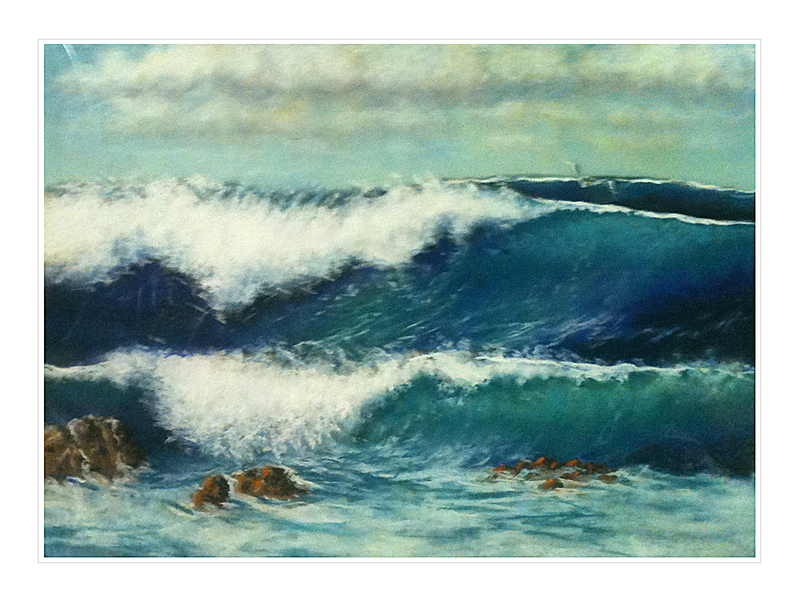 The seascape is a merging of two photos to get double the impact of two big waves, it is a pastel, which seems to be my best medium for seascapes. I have also worked on a couple of paintings from TAFE. I took them for appraisal at AGRA and had a few bits of great advice which I have done – improving the colour perspective a lot in both of them. Today I hope to finish the parrot as I have another project in mind and am keen to get started!! Many of these works are being prepared for the coming Spring exhibition season so that I am not overwhelmed with work from school, monthly workshops, art society demonstrations and showing work. If you see one that you like, you are welcome to make an offer to purchase. Pastel on a full sheet of buff Tex pastel paper. Pastel on a small sheet of Tex pastel paper. Pastel on a full sheet of green Tex pastel paper. Ron Miller is from what I can gather a mostly self taught artist. I had a look on the web for any info about him, but came up with nothing. A bit frustrating when I like to learn about an artist before going to see them demonstrate and like to write about them with a bit more information. As I came into the room, it was a great thing to look at the couple of finished paintings that Ron had brought along and immediately understand the methodology behind the colour. David Chen’s workshops really are making me into a more informed artist. I knew the colours he had used, and the system he had applied which we had just covered in the last few weeks with David, being triadic colour. It does make you feel better as a practising artist to really know stuff like the combination of three darks and a light from the warmer side of the colour wheel, or choosing a dark warm, a light warm and a cool dark and further knowing which ones they were when you look at a painting! So about Ron, he had a lot of jobs over the years including VicRoads and only started painting after retirement. Considering his skill, I can’t help feeling that he must have had something in him as a talent to start with that he has now tapped into and refined as he has had the time. Ron likes a more realist subject and style, concentrating on the atmosphere and light of the Australian bush. He likes to push his tonal values and colours and create a painting that directs you into that sweet spot or focal point. He paints with a limited palette, which I had already worked out to my delight and experiments with things like gel mediums etc on the occasion to see how far he can push his water colours. Working from traditional lights to darks for water colours, Ron built up his images layer by layer gong from an overall wash over the paper to building up the background hills and foliage. With cooler and greyer colours in the background warmer on one side and cooler on the other to indicate the light direction, the painting was built up fairly quickly. The main trees were painted in over a little of the background wash had been lifted from the Saunders paper and modelled allowing the left side to catch the light and simple treating the trunks like cylinders, with the darkest area right next to the lightest and a little reflected light on the shadow side. Foliage was painted in using the side of the brush and done in layers of three tones to show lighter and shadowed areas. Some spots were scratched to indicate branches and distant trunks of trees rather than painting them in. As the darkest darks were applied to shadows on the ground, the paint was much thicker and applied in a scumbling manner to indicate debris at the base of the trees. These were in a much darker tone of the ground cover colour. Hints of a couple of cows were painted in and the reflections now showed up the pond in front of them. A few touches of white gouache were painted in on the left side of the main tree to really silhouette it against the background with the spot where the light touching it was at its strongest. The painting was completed within the timeframe of the demonstration, which a lot of artists given a topic like this one may have struggled to do. The finished work when popped behind a matt board looked professional and very attractive. Overall a very informative water colour demo with some valuable tips.